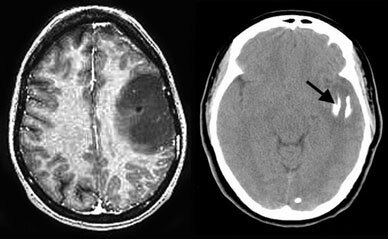 The MRI image (left) shows a large tumor in the left frontal lobe. The CT scan (right) shows that the tumor is partially calcified (arrow). The patient was successfully operated with awake speech mapping in the intra-operative MRI suite. They arise from glial cells called oligodendrocytes. These cells are a normal constituent of the brain but much less common than astrocytes. UCLA offers a multidisciplinary management of oligodendroglioma, with experts in neurosurgery, radiation oncology and neuro-oncology working closely together to assure the highest quality of care. Seizures occur in 50 percent to 80 percent off patients. Other symptoms include headache, nausea and vomiting, ataxia (difficulty with balance), dizziness and altered mental state. Magnetic resonance imaging (MRI) is the preferred diagnostic tool, although computed tomography (CT) is important as well to document whether calcifications exist. Your UCLA neurosurgeon will determine with you how much of the tumor can or should be removed. If the tumor is surgically accessible, a "complete" removal is attempted. Sometimes, oligodendroglioma are best removed with the aid of intra-operative MRI, allowing the most complete, safest surgery possible. Radiation therapy may be considered after surgical removal. The UCLA Neuro-Oncology Program offers the latest in promising medical therapies. For anaplastic oligodendroglioma (a more aggressive type of oligodendroglioma), chemotherapy can be very effective if the tumor demonstrates certain chromosomal (gene) defects.